Sprig Electric, an electrical and data system contractor, announced the installation of a new Tesla Powerpack and solar panel system at its headquarters in San Jose. In a press release, the company revealed the details of the installation, which illustrate the potential of combining solar and energy storage for commercial projects. The system includes 1,177 solar panels that are spread over 20,000 square feet of the building’s roof top and 5 Tesla Powerpacks for 500 kWh of energy storage and 250 kW output. The Powerpacks, inverter and DC combiner are installed in the parking lot of the headquarters and take up a footprint of approximately 10’ x 16’. Sprig Electric uses the battery packs to store electricity in order to reduce peak demand, then to charge them during low demand periods when a surplus of energy is available and the rates are low. The contractor says that the new system, which is connected to the grid, will “cut the building’s total energy costs by 80-95%”. Even though the system went online during the winter, the company says it already generated 6.7 MWh of energy and saved 4.94 tons of carbon dioxide during the first 8 days. Sprig Electric’s installation is among the firsts to utilize Tesla’s Powerpacks since the official launch of the new product line last year. 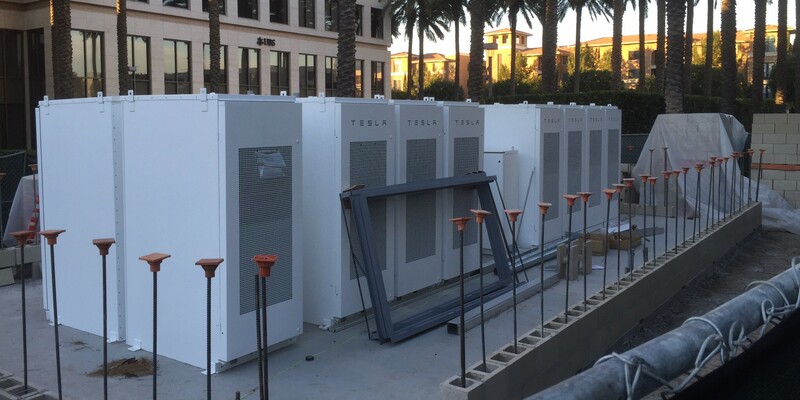 Several other projects are underway under Tesla Energy’s 500MWh deal to supply battery systems to Advanced Microgrid Solutions for commercial and utility-scale installations. Tesla also installed Powerpacks at 3 high schools in the San Diego County school districts. The schools are making good use of the systems due to their time-of-use utility rates, which vary from a low of $0.12 cent per kWh during the night to as much as $0.42 cent per kWh during peak usage. Featured image: Irvine project with Advanced Microgrid Solutions (AMS) via TMC.